For this map I wanted to capture a more Indiana Jones-esque style to dungeon exploring. There are some complicated terrain situations, like jumping from ledge to ledge, crumbling stepstones and natural traps. It also reminds me of the escape scene in The Lord of the Rings where they are jumping from stone to stone in the mines of Moria. I’m really happy with the result. This is part of a half buried complex built by a long forgotten civilization. The DM is free to populate the art, hieroglyphs, bas-reliefs and the like with any ancient culture relevant to the campaign. Appropriate monsters for a dungeon like this are any denizens of the underdark and undead creatures. They might be encountered only in the rooms, not the hallways. Two stepstones are marked as risky. They crumble if 2 or more PC’s step on them, requiring a DEX save (DC 13) to jump to the next or previous stone. 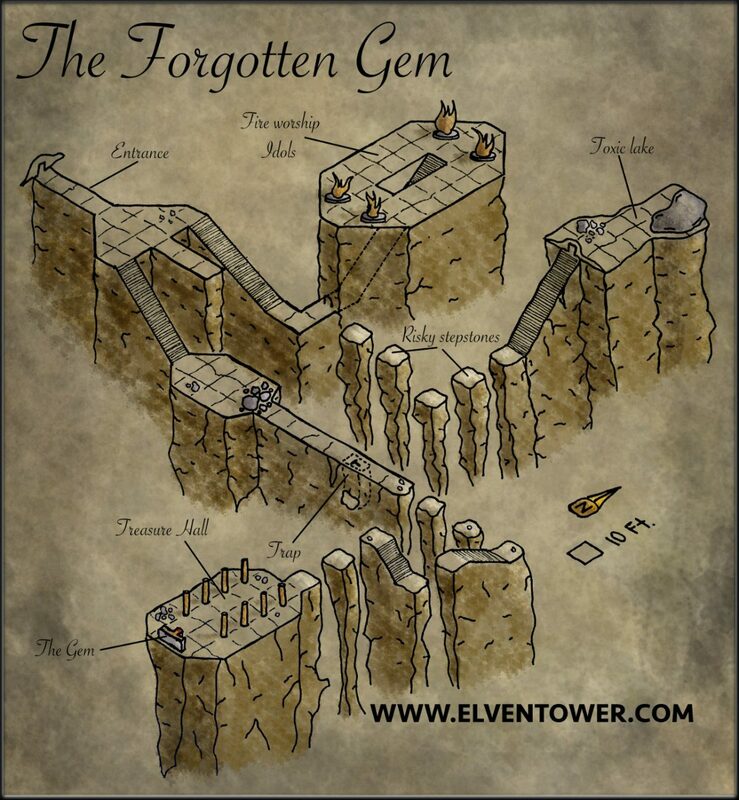 This will complicate traversing the zone, maybe requiring clever rope work or spells like spiderclimb or fly. A hall is marked with a trap sign, part of the floor dislodges itself and can cause a PC to fall. DEX save (DC 13) to jump away from the falling stones. A mysterious gem is the main treasure here, it could just be a very valuable stone, or be magical. The exact magic abilities are up to the DM. You can also trap the gem resting place with poison dart traps, an exploding glyph or the self-destruction of the temple for a dramatic escape scene.